This is a two or three-day diving program that arms you with ample knowledge and skills needed when dealing with an underwater emergency. This course is more physically challenging compared to other programs you have taken so far but it can be twice as fulfilling as you will be able to save your own life as well as others should a diving accident occur. You are required to read the e-Learning training manuals before progressing to the performance-based training. The next step will be the actual dives where our PADI-certified instructors will bring you to the open water to practice what you've read such as self-rescuing skills, search patterns, and in-water rescue breathing. Your knowledge will be put to the test in rescue scenarios as you face two simulated dive emergencies where you can apply the theories you learned and skills you mastered to ensure the safety and survival of everyone. The scuba diving equipment will be provided for you so there's no need to rent or bring your own. How to start the e-Learning part? You can begin studying the e-Learning training materials after settling your payment. Expect an email from PADI within 24 hours containing the redeem code which you can use to create your own account on the PADI website. This will give you access to the Open Water Manual or Open Water Touch app which is composed of five sections of knowledge review, video materials, quizzes, and other interactive references. Pass the final exam and table exam then you’re good to go! Studying the e-Learning lessons gives you a green light to proceed to the actual in-water training. Simply choose a schedule that is most convenient for you and we’ll work out the details from there. 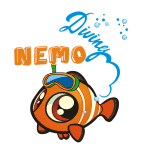 We look forward to seeing you at the Nemo Diving Center on your chosen schedule to fit your scuba equipment and to fill out some forms. After this, our PADI-certified instructors will take you to the beach of Dukes Hotel in Dubai to complete 10 rescue exercises in open water (there's an option to practice your skills first in confined water). The last part of the training requires you to participate in two Rescue Diver scenarios in open water to complete the Rescue Diver course. You must read the first 2 chapters of the e-Learning course before starting the dive sessions. It usually takes 2 or 3 days to finish the course but it also depends on your performance - we want to be sure that you're confident enough when under water. The diving sessions don't have to be 3 consecutive days, you can take the succeeding session/s on a later date as long as it is within 6 months of the first one. Just let us know and we would be happy to arrange the sessions at a time that is convenient for you.